Do you know who the first graduate in your family tree is? I got to thinking about this. I know that my mom was the first person in my direct line to graduate from high school. Who was the first person in my extended family to do so? 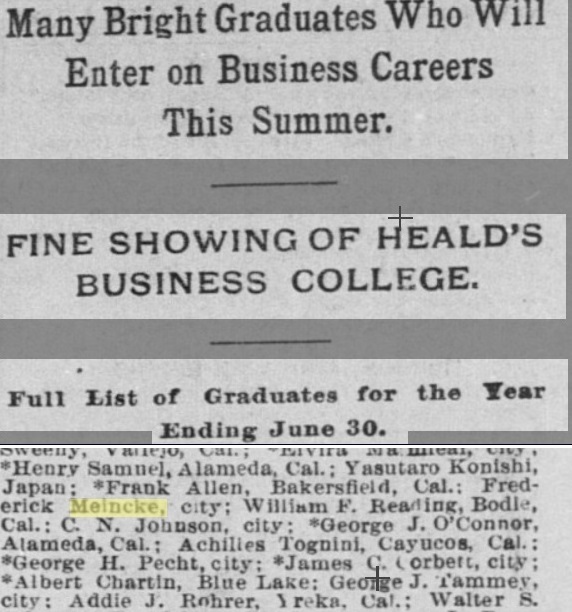 The first graduate that I could find was my great grandmother’s cousin, Frederick J. Meincke Jr. Frederick was a graduate of Heald’s Business School (San Francisco) in 1896. Did you know that Heald’s Business College was founded in San Francisco in 1863? It later became known as plain old Heald College. I guess his degree came in handy. The 1900 US Federal Census states that Meincke worked as a clerk. But, he soon rose to higher ranks. By 1905, he left that job and was the owner of a liquor business on Mission Road. I’m pretty sure this was the Five Mile House that his parents owned. His father died in 1900 and the business was left to his mother. Frederick, as oldest son, most likely took over the family business. By 1906, he got his foot in the door of civil service. He was hired as a clerk for Judge Hunt in San Francisco. Meincke had political aspirations. In 1903, he was a delegate to the Republican Municipal Convention. He ran for the California State Assembly in 1904 and held the post between 1905 and 1911. He represented San Francisco’s District 33. The article below shows that he won with 1,368 votes. I found a little bit of information about his political activities in the San Francisco Call newspaper. He worked on improvements to Mission Road in San Francisco. He also sat on the committee that worked to get funding for San Francisco after the 1906 earthquake. But, it was his views on immigration that caught my eye. 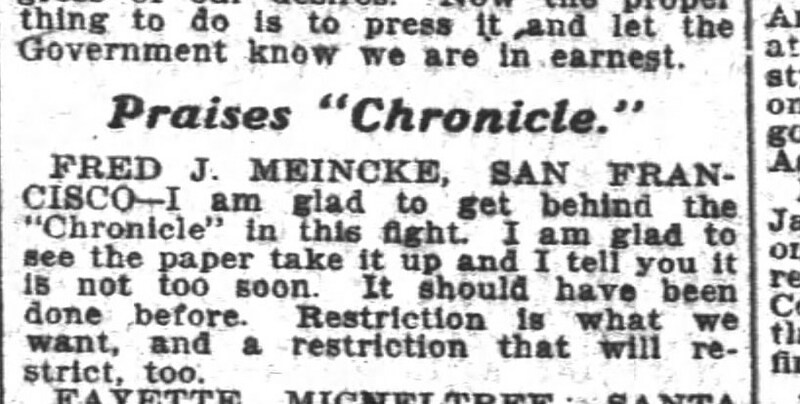 In the 6 March 1905 issue of the San Francisco Chronicle newspaper, several statements from California senate and assemblymen ran under the headline “Unanimous for Japanese Restriction”. The California State Legislature had approved a resolution asking the federal government for Pacific Coast protection against the influx of Japanese immigrants. Frederick Meincke’s statement is below. It appears the newspaper was in concurrence with the state government on this issue. He ended his political career in 1911, but stayed in public service. He took a job as clerk in the San Francisco County Clerk’s office. By 1910, he was promoted to Deputy County Clerk. His death certificate states that he held that position until 1940. Meincke did quite a bit of work in the community. In 1906, he was president of the Native Sons of the Golden West, Twin Peaks Chapter. If you read through turn of the century obituaries, you’ll find his name listed as the contact for fellow member’s funeral services. This item in 15 Dec 1906 issue of the San Francisco Call newspaper was a call to members for the funeral of fellow member, Andrew J. McCarthy. He was a member of San Francisco Aerie no. 5 of the Fraternal Order of Eagles. He also was a member of the Knights of Columbus. The son of Frederick Meincke and Mary Kelly lived a long full life in San Francisco, though he never married. He died at the age of 83 of pneumonia. Although newspapers helped fill in the details of his public life, the one thing I am missing is a photograph. I know from his World War I draft registration card that he was short with black hair and grey eyes. I’d sure like to see a photograph of him though. As Assemblyman and president of a prominent local organization, you’d think there’d be at least one photograph. I’ll keep looking.